This is another instalment in the series of me profoundly disagreeing with trained professionals in areas where I have no experience. At the beginning of the year I got talking to a rowdy bunch of rough blokes at a burger van. I was introduced to the theory (with which I have no reason to disagree) that one of the main differences between married and single men is that married men don't have motorbikes and car parts indoors. Its easy to think that married men are too polite to take oily vehicles into the house but perhaps it's the other way around. Maybe the sort of men who would rebuild an engine on the dining table don't find themselves with the opportunity to propose. Last weekend the man from Caterham told me that my radiator core was weeping. 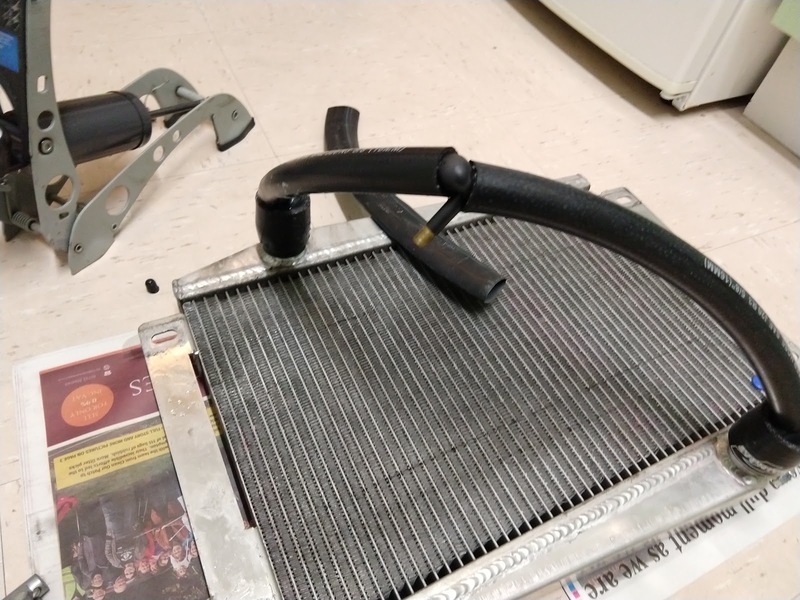 I can see the coolant residue on the fins but I think it's coming out where the top hose joins the inlet. I work with an ex marine architect and he taught me the groundbreaking theory that water doesn't tend to run uphill. As I can see coolant residue above the core I'm pretty confident that that's not where it's coming out. 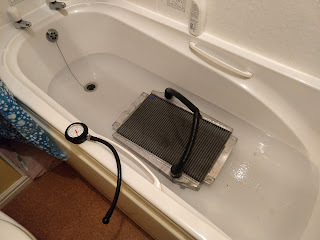 He also told me that I can make my own pressure testing rig at home, and he was right. This is a bicycle inner tube fitted over the inlet and outlet and some old heater hose to support the pressure. It works well up to about 10psi. I then dropped the whole thing into the bath and looked for bubbles. Don't worry, I washed the worst of the dead flies and the grime off (from the bath) before I started. It's probably a good thing that I live alone, but I'm now confident that the radiator itself is intact. Picture this if you can: Me, wearing tartan pyjamas, racing driver shoes and with my moustache elaborately waxed clambering up to the outside of the kitchen window with a bottle of olive oil and a screwdriver in my hand. How did I get into this situation? Like any avoidable disaster it's a tall stack of unfortunate decisions that all seemed right at the time, but that add up badly. I was visiting my friends in Wimbledon at the weekend and they asked me to bring tools so that I could change a window handle for them. I was introduced to my DIY challenge in the washing-up aftermath of our breakfast and it looked like a very simple job. I hadn't dressed because I was still planning to shower. I had already tamed my moustache because I didn't want to eat too much of it with my breakfast. I realised that I needed to get to the outside of the window to change the handle and the patio was cold so I pulled on the most convenient pair of shoes. They were the ones I had taken off when I arrived at the house and as my car has a very narrow pedal box they were driving shoes. It's a house of millennials so there was no lubricant in stock to free off the sticky latch mechanism so I Improvised with olive oil. And all of a sudden they're laughing at the spectacle I'm making. The problems that beset my life seem weirder and rarer than those that normal people have. At the moment, for example, my kitchen floor is covered with molybdenum disulphide. What's that? Very slippery and seemingly completely waterproof. Why? Well not on purpose obviously, I put newspaper down, but it gets everywhere. How? My sportscar has seats that you can slide fore and aft, the squab bears directly on the cockpit floor. Over the year they have picked up grit and marred the floor and the squab. When I was cleaning and proofing the leather I thought it was a good idea to sand the bottom of the squabs flat and lubricate them with "dry moly". It was cold raining and windy outside so I did it in the kitchen and now stepping in there is like stepping onto an ice rink.